In 28 newly- commissioned chapters, distinguished contributors provide an up-to-date overview of sociolinguistics. Florian Coulmas is Professor of Sociolinguistics at Chuo University, Tokyo. He was previously Professor of General Linguistics at Dusseldorf University and Research Fellow of the National Language Institute, Tokyo. He has been visiting Professor at Georgetown University and Fellow of the Institute of Advanced Study, Berlin. His principle fields of interest are the study of writing and sociolinguistics. Introduction: Florian Coulmas (Chou University). 1. The Evolution of a Sociolinguistic Theory of Language: R.B. Le Page. 2. The Demography of Language: Albert F. Verdoot (Université Catholique de Louvain). Part II: Social Dimensions of Language: . 3. Varieties and Variation: James Milroy and Lesley Milroy (University of Newcastle upon Tyne). 4. Language Change in Progress: Variation as it Happens: Norman Denison (Universität Graz). 5. Social Factors in Language Change: William Bright. 6. Sociophonology: John Honey (Osaka International University). 7. Dialect in Society: Walt Wolfram (North Carolina State University). 8. Gender as a Sociolinguistics Variable: New Perspectives on Variation Studies: Ruth Wodak and Gertraud Benke (Universität Wien). 9. Age as a Sociolinguistic Variable: Penelope Eckert (Institute for Research on Learning). 10. Spoken and Written Language: Celia Roberts and Brian Street (Thames Valley University; University of Brighton). 11. The Sociolinguistics of Communication Media: Gerhard Leitner (Freie Universit&aunl;t Berlin). 12. Diglossia as a Sociolinguistic Situation: Harold F. Schiffman (Language Center, SARS). 13. Code Switching: Carol Myers Scotton (University of South Carolina). 14. Language Contact and Language Generation: John R. Rickford (Stanford University). 15. Language Contact and Language Degeneration: Colette Grinevald Craig (University of Oregon). Part III: Linguistic Dimensions of Society:. 16. Language Contact and Language Displacement: Mathias Brenzinger (Universität zu Koln). 17. Language Conflict: Peter Hans Nelde (Research Centre on Multilingualism, KUB). 18. Multi-Lingualism: Michael Clyne (Monash University). 19. Language and Identity: Andree Tabournet-Keller (Université Louis-Pasteur). 20. Language and Ethnicity: Joshua A. Fishma. 21. 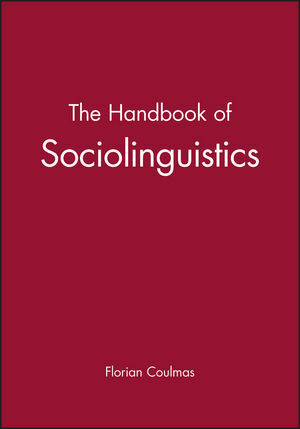 Global Scale Sociolinguistics: Grant McConnell (Université Laval). 22. Language and the Mediation of Experience: Linguistics Representation and Cognitive Orientation: Michael Stubbs (Universit&aunl;t Trier). 23. Linguistics Etiquette: Gabriele Kasper (University of Hawaii at Manoa). 24. Sociolinguistics and Education: Ludo Verhoeven (Tilburg University). 25. Bilingual Education: Ofelia Garcia (City College of New York). 26. Sociolinguistics and the Law: Edward Finegan (University of Southern California). 27. Language Planning and Language Reform: Denise Daoust (Université de Quebec à Montreal). * The definitive encyclopedia of sociolinguistics. * All new articles by the leading figures in the field.